Wireless devices that track cars’ speed and location, communicate with traffic lights, and warn drivers of potential dangers may seem futuristic, but could become mandatory once the tests are completed. Michael Knight in the television series “Knight Rider” had one. Pixar made a movie about them. Now the U.S. government is testing a fleet of so-called “talking” cars that may help American drivers avoid crashes and traffic jams. Over the next year, U.S. officials and the University of Michigan will fit nearly 3,000 cars, trucks and buses with wireless devices that track other vehicles’ speed and location, alert drivers to congestion or change a traffic light to green. 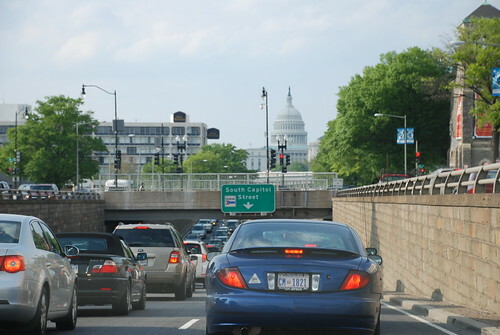 Traffic in Washington, D.C. Photo by Peter Dutton. Granted, these cars will not be as chatty as actor David Hasselhoff’s talking car KITT in the popular 1980s series “Knight Rider,” or the cast of Pixar’s animated movie “Cars.” But they will warn about potential crashes through loud beeps, flashes or vibrations in the driver’s seat. In fact, “vehicle-to-vehicle” communication might help avoid or reduce the severity of four out of five crashes that occur when the driver is not impaired, U.S. safety regulators said. “This is a big deal and I think everybody here believes this has a lot of promise,” Transportation Secretary Ray LaHood told reporters on Tuesday at an Ann Arbor, Michigan, event. The results of the experiment will help the National Highway Traffic Safety Administration decide if the technology should be mandatory. A decision on such a rule would not be made until the test ends in August 2013, LaHood added. The road test underway now is the largest of its kind. The vehicles will be driven in Ann Arbor, a college town of nearly 28 square miles with a population of nearly 115,000. Eight major automakers, including General Motors Co and Toyota Motor Corp, supplied the cars. The test will cost $25 million, with 80 percent of the money coming from the Transportation Department. The vehicles will also be able to communicate with roadside devices in 29 areas in Ann Arbor. If conditions are safe, the vehicles can change the traffic light to green or let the driver know if a light is about to change. Connected vehicle systems use a technology similar to Wifi called dedicated short range communication, which is unlikely to be vulnerable to interference, U.S. officials said. The cars can track other cars’ location and speed. They can also determine if a driver is braking or turning the wheel. Details such as the license number or VIN number are not shared. Automakers currently use radars or cameras to spot problems. Ford Motor Co’s cross-traffic alert system uses two rear radars to detect passing vehicles within 45 feet when a driver pulls out of a parking spot. Radar systems that alert drivers to a possible head-on collision have a reach of up to 200 meters, said John Scally, manager of electric safety and driver assist systems for Honda Motor Co Ltd’s U.S. development arm. The wireless system, however, can detect cars up to 300 meters away. This system can also alert drivers if a nearby but unseen car brakes suddenly. Radar systems cannot detect vehicles around a corner and out of view. “We’ve done things with cameras and radars to look for vehicles around you and on the side. But those are just using proximity sensors,” Scally said. “This will allow us to see everybody around us,” he said of the wireless system. The road test represents the second phase of the Department of Transportation’s connected vehicle safety program. In a study conducted in 2011 and early 2012, the department found that nine out of 10 drivers had a “highly favorable” opinion of vehicle-to-vehicle technology. Each automaker has found a different way of alerting drivers to potential crashes. Many automakers use loud beeps or sounds or a certain message on the digital instrument cluster. Others use more discreet haptic systems, which vibrate the driver’s seat or steering wheel. Some use all three. Ford uses beeps, red LED lights and a vibrating seat to tell the driver to slow down, said Ford’s technical leader for vehicle communications Michael Shulman. Executives said it is crucial that vehicles’ safety alerts are not overly sensitive. Too many warnings would likely annoy drivers who might turn them off or ignore them outright. Reporting by Deepa Seetharaman; Editing by Tim Dobbyn and Andre Grenon.